Uniform of General Joseph Eggleston Johnston, CSA. Commanded the Army of Northern Virginia before General Lee was assigned to that command. Johnston wore a very distinct and unique uniform. A double breasted Frockcoat in Dark Grey Wool, often called "Richmond Grey", our coat features the 19 ounce weight wool with black cotton lining and natural sleeve lining. A black polished cotton lining are offered as options. Buff faced collar, cuffs and rear pocket flaps. Buff piped front and back edge. Four rows of Gold Sleeve Braid denoting General. Confederate Staff Buttons in the 4x2 arrangement are sewn on. Collar insignia contains two 5 point gold stars with a slightly larger 6 point star in the center without the regulation wreath surrounding the stars. Raw skirt edge. 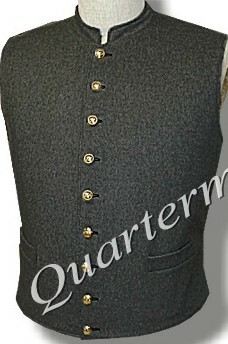 Military style Vest with small standing collar in matching dark grey wool. Black cotton back with adjusting belts and buckle. Confederate Staff Officer buttons are sewn on. 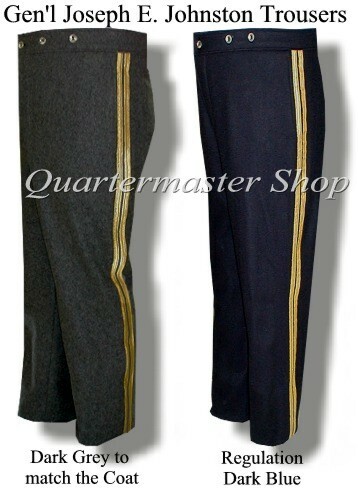 Confederate Foot style Trousers with side seam pockets in matching dark grey wool. Regulation Dark Blue is also available, choose below. Split waistband with back belts and buckle for adjustment. Two 5/8" gold lace stripes- regulation for Generals, with a 1/4" window of grey showing. Eleven Tin buttons for fly and suspenders are sewn on. Raw inseam of 35.0". Need other items to complete your C.S. Civil War Officer's outfit?